Photo: . Rear view; see below for font view. 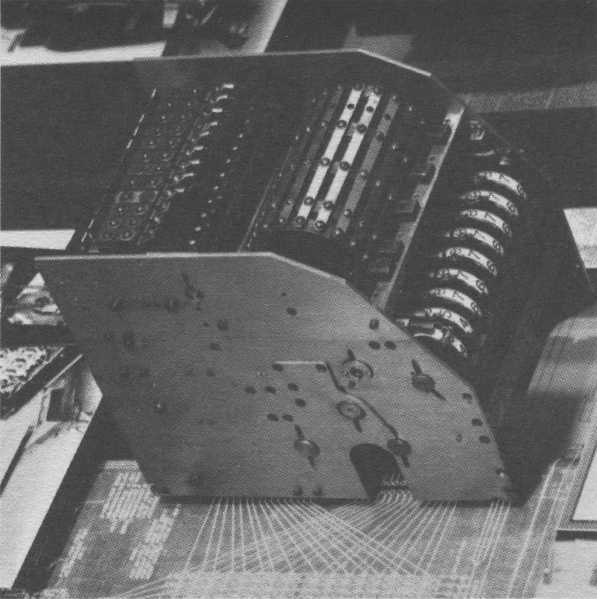 In 1930, Columbia Professor Ben Wood, who had begun Columbia's half-century long special relationship with IBM in 1928-29 when he founded the Columbia Statistical Bureau with a large grant of standard late-1920s punched-card machines from Thomas J. Watson, approached Watson again with a request for a machine more suited to the needs of statistics than business. Watson obliged, and had engineers James Bryce and George Daly in IBM's Endicott plant build a gigantic tabulator capable of accumulating sums of squares, raising numbers to powers, and so forth by means of direct subtraction (the first punched-card machine to do this) plus a novel system of ten paired accumulators. The new machine "mass-produced the sums of products by the method of progressive digiting and read punch cards at the rate of 150 per minute. 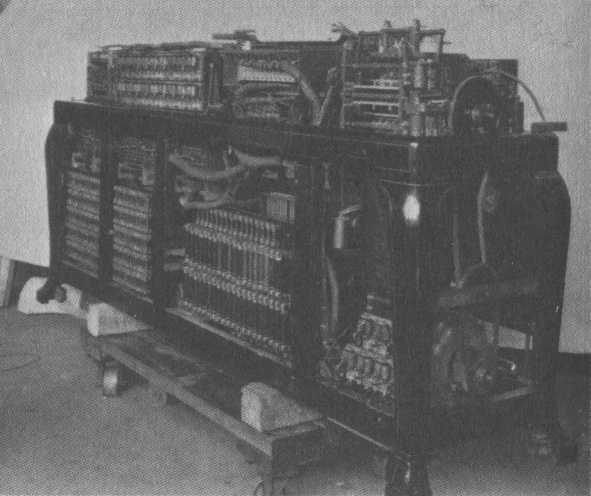 It contained ten 10-position counters (left, Photo: ; click to enlarge) with provision for shifting totals internally from one counter to another – a capability that anticipated a future function of computers." . 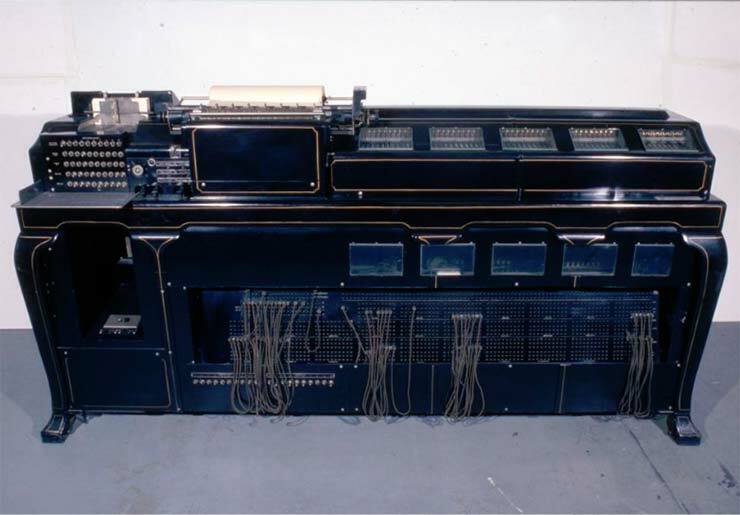 The new machine, variously called the "Columbia Machine", the "Statistical Calculator", the "Difference Tabulator", and (because of its massive size) the "Packard", was delivered and installed in 1931. CLICK HERE to see the Smithsonian page for this machine. New statistical machines with the mental power of 100 skilled mathematicians in solving even highly complex algebraic problems were demonstrated yesterday for the first time before a group of psychologists, educational research workers and statisticians in the laboratories of the Columbia University Statistical Bureau in Hamilton Hall. One of the tabulators exhibited can work out and print the results of as many as twelve difficult problems in just a single rapid operation. It is designed to handle differences and reckon powers of numbers up to the tenth, whereas such machines hiterto [sic] have been able to compute only the second power of numbers. Richard Warren and Robert M. Mendenhall, research workers at Columbia and statistical consultants for the Carnegie Foundation for the Advancement of Teaching, are responsible for most of the inventions which were first announced at the educator's convention in Atlantic City last week. (The clipping breaks off here.) I can't imagine what they are talking about, unless it's the Columbia Difference Tabulator or a prototype of it. Pugh, Emerson W., Building IBM: Shaping an Industry and its Technology , The MIT Press (1995).